AdWords is Awesome… But Don’t Forget About Your Landing Pages! Don’t Forget About Your Adwords Landing Pages! This week I’m continuing a series of posts focused on Google AdWords. However, this post is a little different… it addresses an important topic OUTSIDE your AdWords account. By “outside”, I mean where your AdWords ads are sending the traffic (i.e., the landing page). If you are aiming to generate leads, landing pages are a hugely important component to any AdWords campaign. You can do everything right within your account (solid account structures, nicely targeted keywords and smart use of negatives, well written and relevant ad copy, smart bidding strategies, etc. ), but without quality landing pages, you’ll leverage a very small percentage of that traffic you’re paying for! Hands down, the biggest mistake those of us in the pay-per-click management business see clients make is having a single landing page for all their ads… and guess which page it is? Yep – their website’s homepage. I can’t blame folks for making this mistake. It’s the most logical entry point for experiencing your brand. It’s also easy to use as your destination URL in AdWords because it already exists. But here’s the problem: Relative to a properly constructed landing page, your homepage will almost always convert far fewer visitors into actual prospects. One step in the right direction is sending your AdWords traffic to product specific pages on your website. Retailers do this all the time. 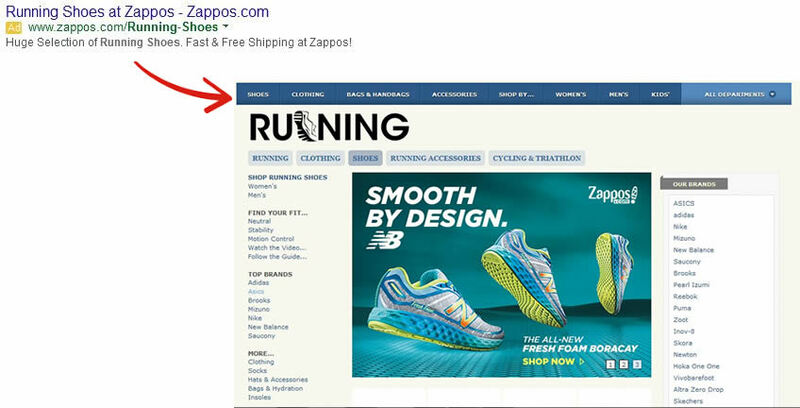 When you search for the keyword phrase “running shoes” on Google, you’ll see Zappos.com’s AdWords ad. When you click on that ad, you won’t be directed to Zappos.com’s homepage, but a specific page on their site dedicated to running shoes. Of course, you can get even more granular by matching a specific shoe type keyword phrase such as “Asics Gel Nimbus” to a page specifically dedicated to the Asics Gel Nibus. In fact, if you’re a pure retailer seeking to drive online sales, this may be your best strategy. But for a whole slew of others… especially those in the business-to-business world, the objective is to turn a casual visitor into an interested prospect or trial user – this allows you to start an ongoing relationship with that prospect over time through email, phone or direct mail – or, in the case of a trial user, get them to experience and become “hooked” on a great product. Most companies today use a “lead magnet” strategy, offering some form of free content (or access) in exchange for the prospect’s contact information. The free content often takes the form of a whitepaper, checklist, webinar, free trial, etc. The rest of this post is focused on helping you increase your AdWords return-on-investment by using specialized landing pages. 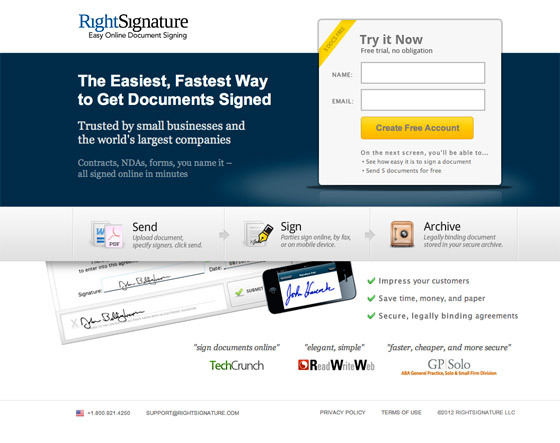 In other words, creating pages that compel visitors to offer up there contact information. There are lots of articles out there that list the 5-10-20 best practices for creating high converting landing pages – a lot of it is great stuff… but I’m not going to approach it that way. Instead, I’m going to provide you with just three specific visual examples. Then I’m going to briefly identify the elements that I believe make these pages so effective at generating leads. This is one topic where a picture is worth a thousand words. 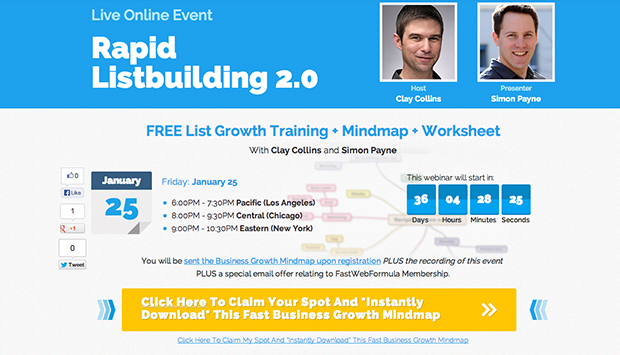 Let’s look at our first example of a great landing page. Strong visual impact… image draws me in. Overall, it’s clean and simple. Huge button leaves no doubt what I’m supposed to do here! Minimum form fields to complete… it’s quick and easy! 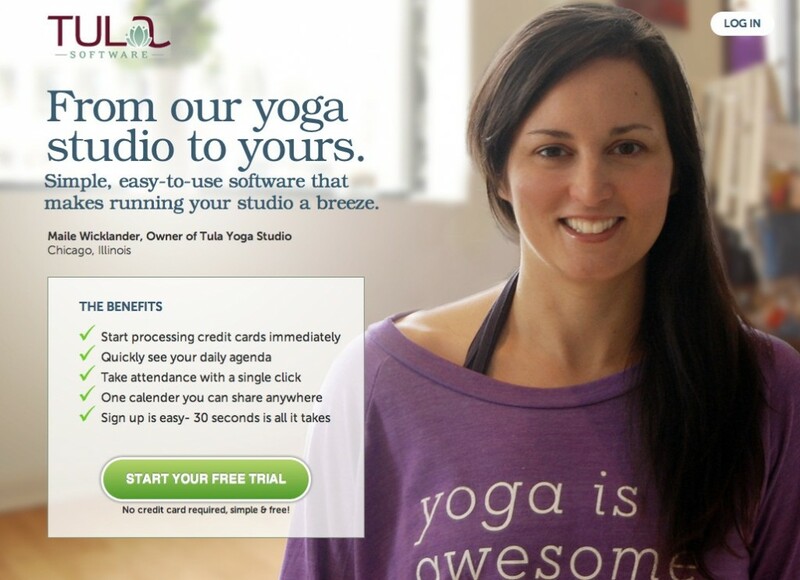 Hopefully these example were helpful and gave you some ideas for your own landing pages. One last point, just like there are no “perfect” AdWords ads, there are no “perfect’ landing pages. It’s important that you create and test different versions of your landing pages (even if the differences are slight) to identify which version(s) outperform the others. Great marketers are always testing! Next week I’ll wrap up my series on AdWords by helping you evaluate the overall effectiveness of your campaigns through conversion tracking.